Keto Mini Cheesecake Bites - Quick and Easy Recipe! 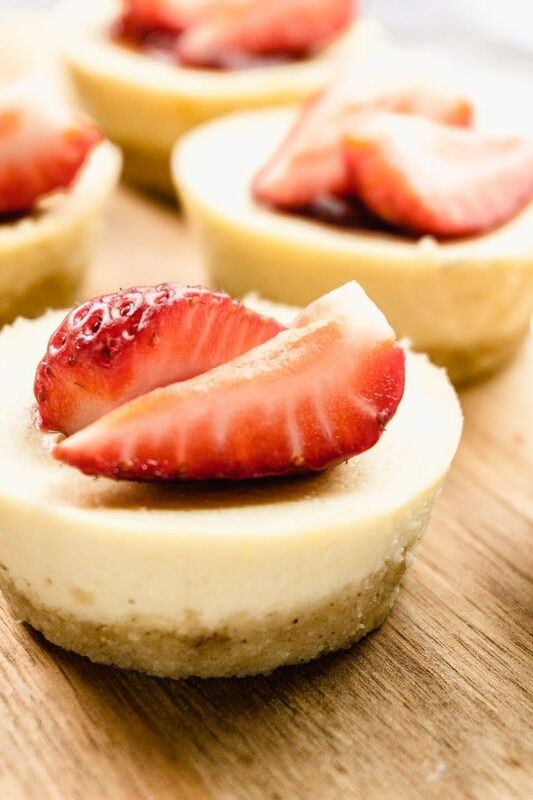 These mini cheesecakes are perfectly sweet, creamy, and delicious. But more than that — they’re low in carbs, gluten-free, and keto friendly. 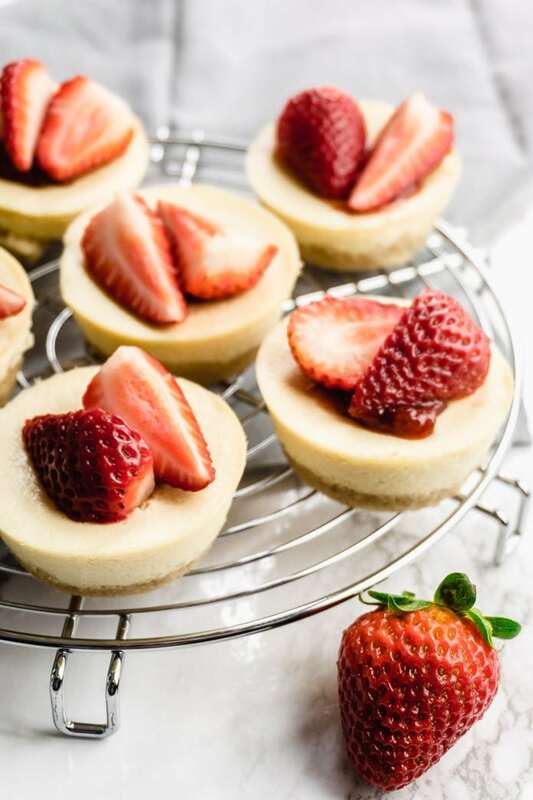 You can serve these keto cheesecakes plain, or top them with a drizzle of strawberry puree and some fresh sliced berries. 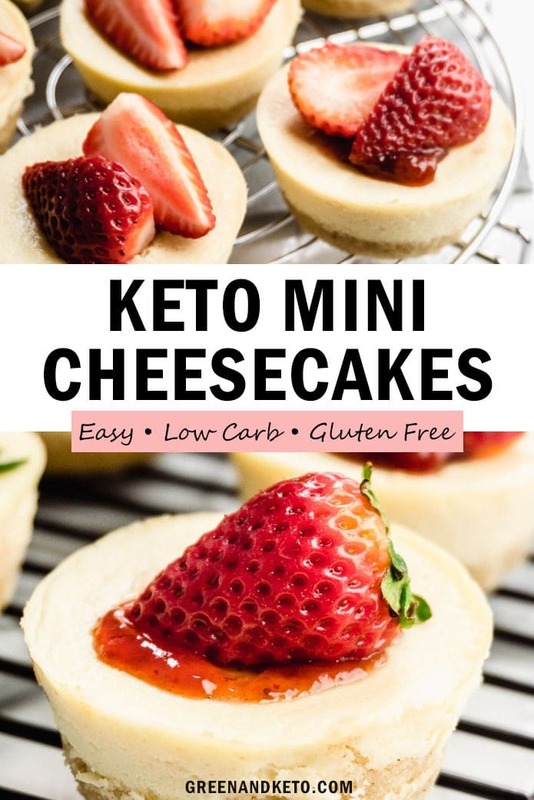 Keto cheesecakes are made with traditional ingredients like cream cheese and eggs, and sweetened with a low-carb sweetener like Swerve or erythritol. You can make all sorts of flavors of keto cheesecake. Check out this reader-favorite Keto Pumpkin Cheesecake for a delicious holiday version. 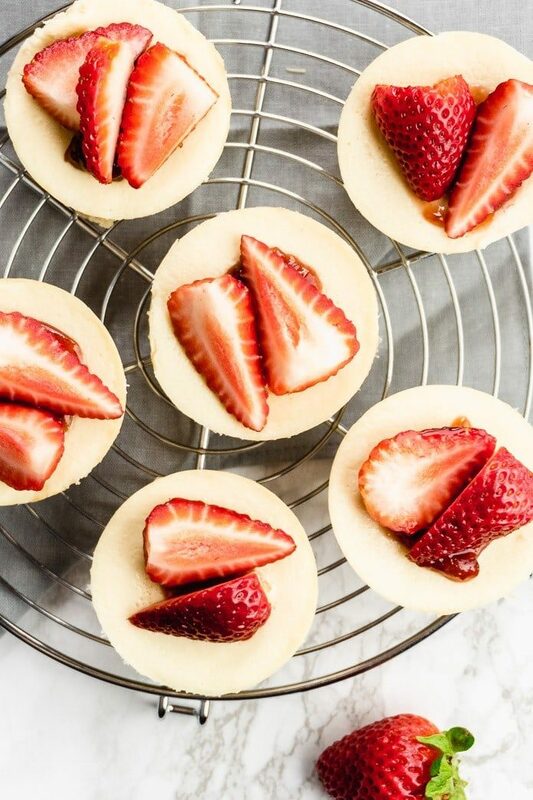 You can choose to make these mini cheesecakes with or without a crust. My favorite keto cheesecake crust is made with almond flour, a little butter, and a pinch of low-carb sweetener. Cheesecake is one of my favorite keto friendly desserts. It’s actually one of the easiest desserts to fit into a low-carb lifestyle. Except for the sugar, most of the ingredients in a traditional cheesecake are already low-carb. Cream cheese is a common ingredient used in many keto and low-carb recipes. The carb count of cream cheese varies according to the brand. For example, Philadelphia brand cream cheese has less than 1 carb per serving. An entire 8 oz block of cream cheese — like we use in this recipe — has 4 carbs. 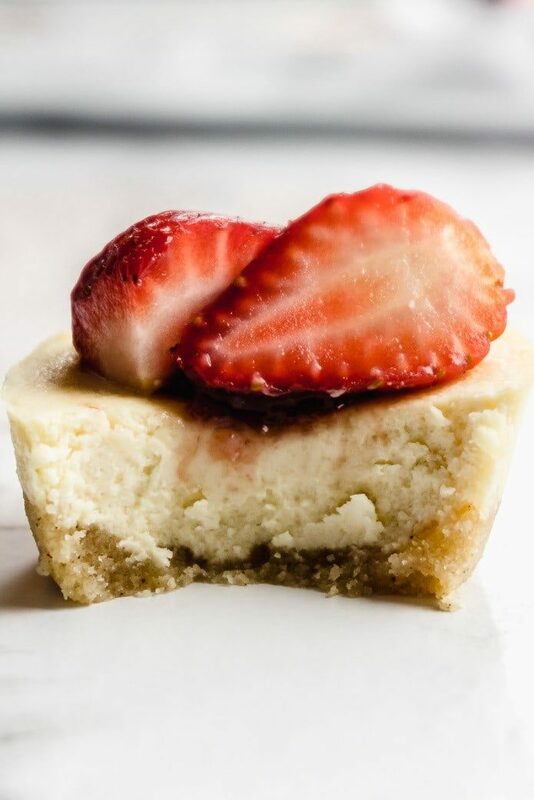 Other low-carb ingredients in cheesecake include eggs ( less than 1 carb per egg), erythritol (0 net carbs per serving), and almond flour (which adds 1 carb per mini cheesecake crust). 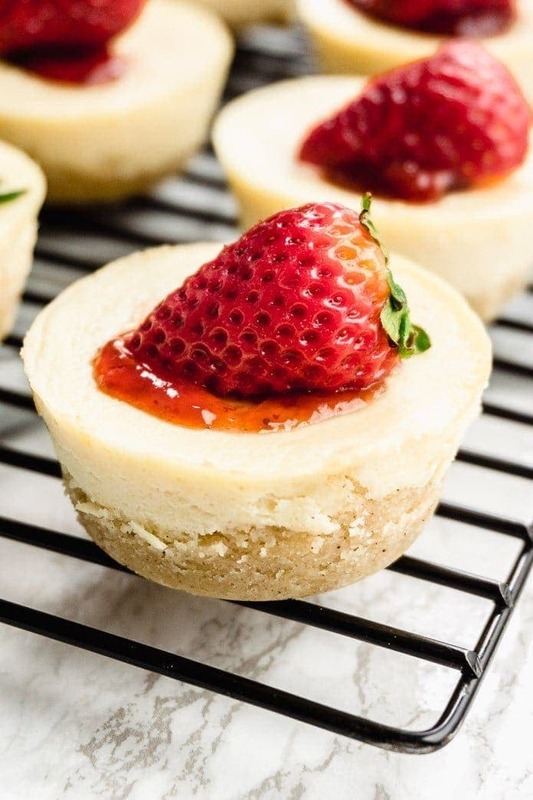 This recipe for mini keto cheesecakes makes 6 muffin-tin size cheesecakes. Each mini cheesecake has 2 carbs with the crust, or 1 carb if you choose not to make the crust. If you top each cheesecake with one large strawberry (like I’ve done for these photos), the total dessert has 3 net carbs per serving. Regular cheesecake is pretty high in carbs due to its sugar content and traditional graham cracker crust. 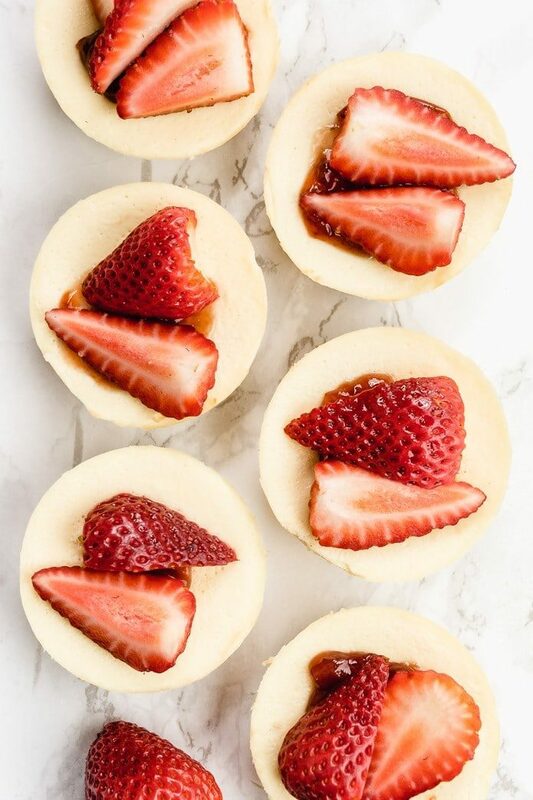 But, these mini cheesecake bites are made with cream cheese, an alternative sugar-free sweetener, and an almond flour crust — so they are naturally gluten-free and low in carbs. Here’s what else you’ll need for this recipe. Cream cheese. Choose full-fat cream cheese for this recipe. Be sure to let your cream cheese come to room temperature before you begin baking. Room temperature ingredients incorporate much more easily — helping you to prevent lumpy cheesecake! Powdered erythritol sweetener. 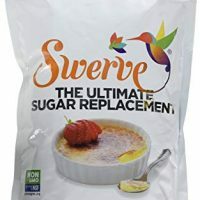 I like Swerve granulated sweetener for this recipe. You could also use powdered Swerve if that’s what you have at home. Eggs. I use large eggs in all of my recipes. Just like with your cream cheese, let your eggs come to room temperature before beginning to make this cheesecake. If you need to bring eggs to room temperature quickly, you can place them in a large bowl of hot water for a few minutes. Almond flour. 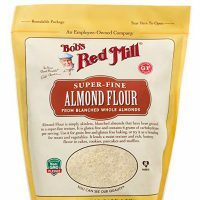 I usually recommend super-fine blanched almond flour in my keto baking recipes. Blanched almond flour gives the finished baked good a fine texture and light crumb. That said — in this particular crust recipe, you can substitute natural almond meal with no problems. Butter. You could also use coconut oil in a pinch. Erythritol sweetener. I like Swerve brand. Sweeteners like Xylitol and Pyure brand sweetener can also work. You’ll just want to check the conversion chart on the back of the bag before you begin baking. For example, Swerve has a 1:1 ratio of sweetness to sugar. 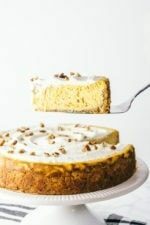 I think that this keto cheesecake crust is a delicious complement to the creamy filling. It takes just a few ingredients and it’s quick to make. Like most low-carb crust recipes, this recipe starts out with almond flour. To the almond flour, I add a couple of tablespoons of melted butter. I also add a tablespoon of sweetener and a pinch of salt and cinnamon. Then, I mix all of the ingredients together in a small mixing bowl. The texture should feel like moist sand. Next, I divide the crust mixture between 6 muffin tins. 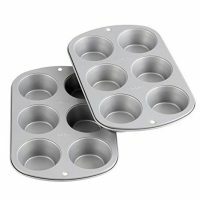 You can use your fingertips or the bottom of a small measuring cup to press the crust into the bottom of the muffin tin. In my case, my 1/4 cup measuring cup was just the right size to press the crust mixture into the bottom of my muffin tins. All that said, if you don’t like crust or don’t feel like taking the extra step — feel free to skip it. If you decide to make a crustless cheesecake, just take care to grease the muffin tins really well, or use paper cupcake liners. For a creamy cheesecake with no lumps, here are my best tips. For the smoothest cheesecake, make sure that all of your ingredients are at room temperature before mixing the batter. Check your oven temperature. Sometimes ovens run hot. And baking a cheesecake at too high of a temperature may cause it to crack. If you are not sure if your oven temperature, I recommend using an inexpensive oven thermometer to double check. In my experience, cheesecakes are best baked between 300 and 325° F.
Bake the cheesecake until it is just done. Remember that cheesecake is a custard, so it’s not supposed to be super firm. A cheesecake is done with the center is almost set, but will still wobble or jiggle a bit. A cheesecake will set up more as it cools. So, make sure to take the cake out of the oven while the center still jiggles when you tap the side of the pan. Grease the sides of your pan. Sometimes you’ll pull out a beautiful cheesecake (with no cracks) that will develop cracks as it cools. This is because the cake shrank during cooling, but stuck to the sides of the pan, making a crack in the center. To avoid this, make sure to grease the sides of your pan. For extra insurance, run a thin paring knife around the sides of the muffin tin to release the cheesecakes after you pull it from the oven. 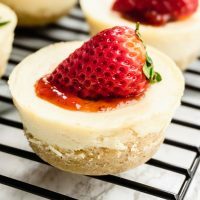 If you are looking for other types of keto cheesecake, check out this reader-favorite Keto Pumpkin Cheesecakeor these Strawberry Cheesecake Fat Bombs. And, if you’d to check out our other keto baking recipes, why not try Keto Oreo cookies, Cinnamon Crumb cake donuts, or Keto Vanilla Cupcakes with Buttercream Frosting? Pin this post to your Keto Desserts board to remember it for next time! Creamy and delicious mini cheescakes are one of the best keto-friendly desserts. 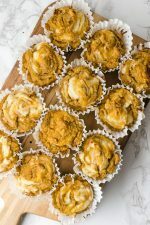 These keto cheesecake bites are low-carb and gluten-free, but you'd never guess with how amazing they taste! Preheat oven to 300 degrees F. Grease a 6 cup muffin tin, or prepare with paper cupcake liners. Make the crust: Combine almond flour, sweetener, cinnamon and salt in a mixing bowl. Stir well to break up any lumps in the almond flour. Add the melted butter to the dry ingredients, and stir to combine. Using your fingertips, press down flat into the bottom of the muffin tin. Bake for 10-15 minutes, until just beginning to brown. Remove, and let cool at least 10 minutes while you make the batter. Make the cheesecake batter: In a large mixing bowl, beat the softened cream cheese until smooth. Add the sweetener, egg, vanilla extract, and salt. Stir together until well combined. Pour the cheesecake batter on top of the crusts. Bake for 18-20 minutes. Check the cheesecakes for doneness, removing when the center of the cheesecakes still jiggles a bit when you tap the side of the pan. Remove from the oven. Let cool on the counter for 30 minutes, then cover and chill in the refrigerator. (See unmolding tips in the notes. To unmold the cheescakes, run a thin paring knife around the edge of the cheesecakes to help release it from the muffin pan. If your cheesecakes are really stuck, you can place the bottom of the muffin pan into a sink of hot water for about 15-30 seconds. If you want the crust to reach all the way up the sides of the cheesecakes, you can double the crust recipe. Serve with a dollop of strawberry puree, fresh berries, or sugar-free jam. Nutrition information is provided as a courtesy and will vary depending on what brands of ingredients you use. This data was provided and calculated by My Fitness Pal, and isn't always accurate. hi.. can i use honey substitute sugar? I’ve never tried that, but if it’s a 1:1 style substitute you are welcome to try! Let me know how it goes! I’m using pyure. It looks like a 1:2 ratio. Recommend cutting my sweetener in half? Yes, that’s a good idea. One thing you can do is mix the cream cheese and sweetener together and give it a quick taste before you add the raw egg. That will give you an idea if you need more sweetener or not. Hope that helps! Thank you for this amazing recipe!!!! Seriously delicious! I followed the directions very carefully…but my cheesecakes puffed up and then sunk down into little cheesecake bowls. Any advice on that? Yours are so perfectly flat. Thanks again! I’m glad it still tasted delicious!! My only idea is that maybe your oven is running a little hot? Do you have an oven thermometer to check the temp? I was wondering if i used a mini muffin pan how long would it take to bake? Looking to make bite size ones if possible. Had anyone tried it this way? I haven’t tried them this way, but I imagine they would cook really quickly! Now this is just a guess, but you could try checking after 10 minutes. You just want to take them out while they still have a bit of “wobble”. 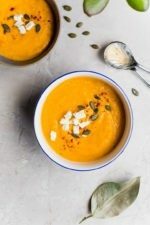 Let me know if you try it, and I’ll update the recipe with what you find out! Hi! I made these and they were delicious! A little to difficult to get out of the muffin pan, but I’d use liners next time I make these and it would probably be no issue. Quick question: do you think this would work out if I made it into a large pie in a pie dish instead of the muffin tin pan? 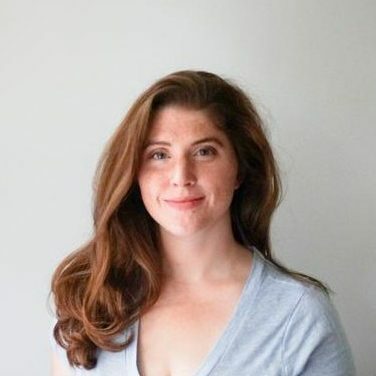 Any thoughts on cook time? I’d probably double the recipe. I think it would work well in a pie dish, but I haven’t tested it. I know that my pumpkin cheesecake (which is about double this recipe) cooks in 50 mins in an 9″ round pan. That may be a good starting point for you — but it would depend on your specific pan.